The generous gift will allow the College to establish the OSilas Endowed Professorship in Environmental Studies in the 2020-2021 academic year. 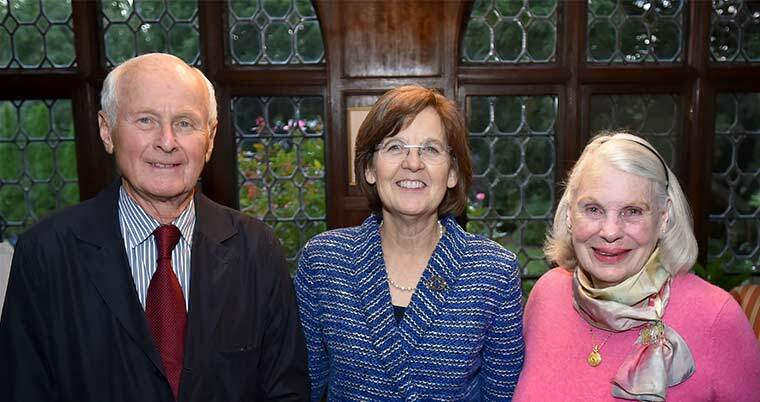 Broadly defined in its focus, the professorship is intended to enhance the scientific underpinnings of Sarah Lawrence’s work in the field. To give the College time to define and recruit for the new position, in the 2018-2019 and 2019-2020 academic years, the gift will support summer internships for Sarah Lawrence undergraduates at the Dodge Nature Preschool in West St. Paul, MN, and at Sarah Lawrence’s Center for the Urban River in Yonkers, NY. It will also fund newly developed environmental studies courses taught at Sarah Lawrence by visiting professors. Pictured left to right: Si Ford, President Cristle Collins Judd, Vicki Ford. Photo credit: Dana Maxson.